Tom Lorraine insists the AFC Rushden & Diamonds players have simply met their own high expectations of themselves so far this season. 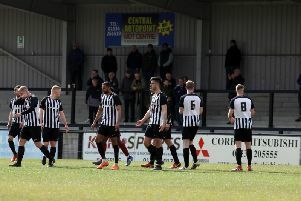 As the halfway point of the season approaches, Diamonds are sitting pretty in third place in the Evo-Stik League South Premier Division Central. It’s been a superb start to life at Step 3 with Andy Peaks’ side taking things up a gear with a fine 4-1 victory at Leiston last weekend while another tough test lies ahead at Alvechurch on Saturday. And while many outside of Hayden Road will have been surprised by the way Diamonds have taken to life at a higher level, frontman Lorraine says that isn’t the feeling in the dressing-room. “From a football club point of view, consolidation is absolutely right,” the striker, who is the club’s all-time leading goalscorer, said. “Whenever you go up to a new level, you have to find your feet. You have to walk before you can run. “But strictly from the players’ point of view, we see what we are doing in training and we feel confident going into every game. “Even when we haven’t got the results this season, we feel we have played pretty well in every game but to look at the league table now at the start of December and seeing where we stand, I am not sure many would have predicted that. “We know we have quality in the squad so I don’t think it is a huge surprise to the players. “There isn’t as much expectation on us as there has been before because we have always been expected to go for titles and promotion and there is less pressure on that side of things this season. “I don’t think what we have done so far has come as a surprise to the people who know the players and staff. Lorraine has been one of the key figures in Diamonds’ rise up the divisions. His goal in the win at Leiston was his 81st for the club while he also has over 200 appearance to his name since joining from Cogenhoe United in 2014. Lorraine has adapted at every level so far and he has done it again as he currently leads the club’s goalscoring chart this season with 11 to his name so far. He joked: “That’s 11 for the season now and I am not sure how! “To be honest, I had a little word with myself at the start of the season because I knew there probably wouldn’t be as many chances coming my way. “I knew I would have to be more clinical with the chances and I think I have been. “It helps when you are surrounded by good, creative players but we all have to be clinical to keep the goals flowing. “I think the most pleasing thing is that everyone is chipping in. We are scoring goals from all over the pitch and you need that to be successful."